The snowbirds don’t know what they’re missing when it comes to the best time to hit the Southwest Florida beaches. Most head north before the Gulf waters have had a chance to warm to optimal swimming temperatures. 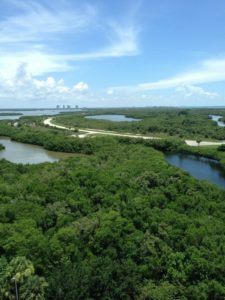 Lovers Key/Carl E. Johnson State Park, with its 1,616 acres providing two-and-a-half miles of undeveloped beachfront as well as back bays, provides an ideal place to enjoy the finest that summer has to offer in Florida. Located on four barrier islands situated between Fort Myers Beach and Bonita Springs, Lovers Key Park offers many personalities. A visit can be about a trip to the beach, but it can also be about hiking, biking, fishing, nature photography, picnicking or back bay kayaking, canoeing and stand-up paddleboarding. It can also be about an upscale dinner or a stay at the nearby boutique resort or a voyage made to the park aboard your own boat. It can even be about a wedding or family reunion in the beachfront gazebo. The park’s big draw in summer is the white sand beach, which was renourished last October and is now 300 feet in width. The beach is unique in Southwest Florida in that it is secluded on the far outer island, the one actually named Lovers Key, so it is two islands away from Estero Boulevard, the main road. One of the more popular ways to reach the beach is via the park tram. It loops every 15 minutes between the hours of 9 a.m.-4:30 p.m. from the parking area inside the main park entrance to the shoreline. The tram crosses two bridges on the way to the southern end of the beach, giving visitors a chance to view the mangrove estuary habitat that draws so much wildlife to the park. Near the covered tram shelter on the beach, the park features a shower house and a gazebo that is available to rent for events such as weddings or family reunions. The south beach also features Hurricane Charley’s Hideaway, a bamboo-covered snack shack that also offers beach chair and umbrella rentals and beach necessities for purchase, such as towels, toys, sunscreen and sunglasses. The snacks are basic — heated hot dogs and burgers, chips, soft drinks and ice cream — but they hit the spot without having to leave the beach. For more substantive and upscale rations, or for alcoholic libations, Flipper’s on the Bay awaits at neighboring Lovers Key Resort. The boutique resort and restaurant sit across Estero Boulevard from the park’s small, northern access parking lot in view of the Big Carlos Pass bridge. Serving breakfast, lunch and dinner, the open-air eatery with a bayfront view serves many chef’s signature dishes and favors seafood. Breakfast dishes run $9-$16, lunch $10-$17 and dinner $17-$34. It also offers a full bar featuring signature and frozen tropical drinks that run $8-$15. The high-rise, all-suites resort has 50 of its 100 units available through its rental program, so it’s a very exclusive and secluded place to stay. All units feature a king-sized bed, a queen-sized sleeper sofa, a balcony with a water view and a full or galley kitchen, depending upon the type of unit. During the off-season, the resort offers a Florida resident special that can bring the nightly price down to as low as $137 per night, depending upon the date and unit type. Jeffrey Bullock, the general manager of the resort, said that complimentary hot breakfast from a prix fixe menu is also included for resort guests staying between May and mid-December, excluding holidays. He also said the resort offers complimentary late checkout on Sundays during the off-season as well as an attractive Sunday stay-over rate to encourage guests to make it a three-day weekend. For visitors who seek more of an outdoor adventure than lolling on the beach or sipping rum punch with a bay view, the park’s concessionaire, Lovers Key Adventures & Events, offers bicycles, kayaks, canoes, pedal boats and stand-up paddleboards for rent. Guided kayak tours led by coastal naturalist and photographer Stephen Denmark are also available by reservation. The park also offers an ideal location for a relaxing day of fishing. Across Estero Boulevard from the main park entrance, the bait shop and boat launch ramp open at 6:30 a.m. daily, before the rest of the park. Boat launching and parking are included free with the $2 per person limited-area admission fee to this bayside section of the park. The shop stocks most everything boaters would need for a day of fishing, along with advice about the local waters. Kayaks and canoes are also available at this location as well, and the back bay provides opportunites for wildlife watching and photography in addition to fishing. So whatever the flavor of outdoor fun, adventure opportunities for year-round residents abound at Lovers Key State Park. It’s a little reward for sticking it out through the summer heat and humidity. Note: Dogs aren’t allowed on the beaches at Lovers Key, but the official Lee County Dog Beach is located just south of the park. Alcohol isn’t allowed in the park, except for that served at private functions, such as weddings, by vendors contracted through Lovers Key Adventures & Events. By sea: The four islands of the park are located between Big Carlos Pass and New Pass. By public transit: Lee Tran offers bus service to Lovers Key on route 400 (beach trolley) from the north and route 150 from Bonita Springs. The bus stop is almost a half-mile walk from the beach tram pickup, so either pack light and rent items such as beach chairs, or load your bicycle on the front of the bus. See rideleetran.com for more information. By sea: Enter Big Carlos Pass, go under the Estero Boulevard bridge and the restaurant is on the south side of the channel. Anchor out and swim or wade in — no dock. Note: Check website or call for off-season specials, such as Florida resident rates. © 2019 Flippers On The Bay. All rights reserved.